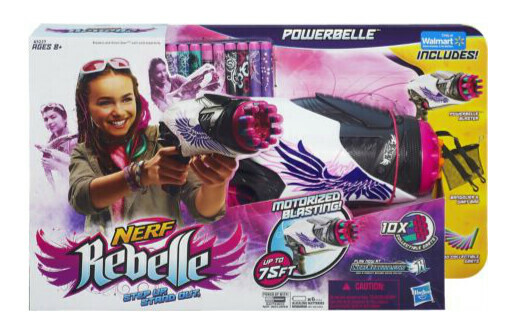 Argos UK recently put up a listing for the Rebelle Guardian Crossbow, but that listing also included the above blaster. If you’ve been a Nerf fan for a few years, you’ll recognize it as a repaint of the Dart Tag Speedwarm from 2011. 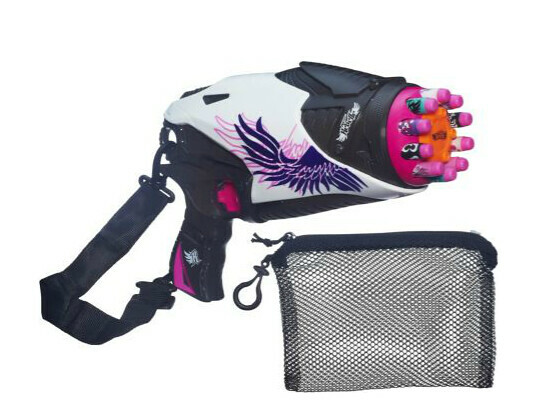 The blaster also comes with a small sling, small dart pouch, and ten darts according to the bottom photo. A bit thing though is that on the box art, it claims the blaster is getting up to 75 feet, which is Elite ranges. If this is true, it must have some sort of internal changes. Time will tell if America will get this blaster. Outback Nerf sent the above photo my way. 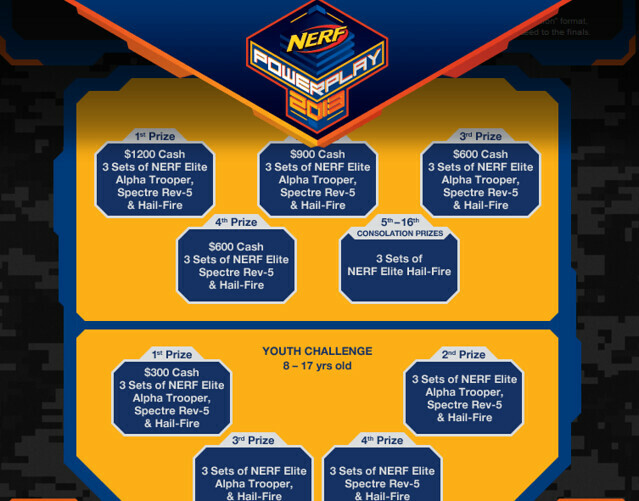 Apparently a tournament called the “Powerplay Tournament” is giving out a new Elite Spectre, Elite Alpha Troopers, and Hail-Fire’s as prizes for this tournament, as well as cash prizes to the top winners. Interesting isn’t it? Registration opens May 31, and the event takes place from June 21-23. Check their official site for more info on the event. You can also click here for the official rules, or check here for a FAQ of commonly asked questions. You can’t quite see it in the screenshot that I took above, but the top prize bracket are for the 18-55 age group. I’m glad to see that their embracing the older audience of Nerf over there. Adding up all the cash money prizes, that’s $3,600 their handing out! Talk about high stakes. As for the Elite Spectre, it looks pretty nifty. There’s a lot of White and Blue on it, which isn’t a bad thing. I just used to seeing more orange it. I was planning on trying out the Rapidstrike with an original Spectre barrel on it, but now that this is coming out, it’s attachments just begging to get added to all the Elite blasters currently. 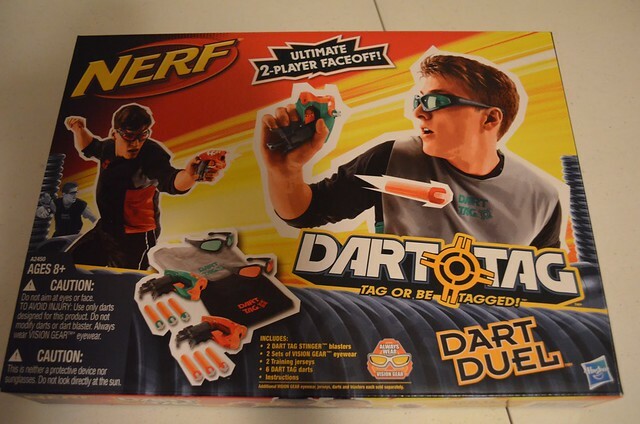 Thanks to My Last Dart for the heads up on this new bit of Nerf info. It looks like the latest blaster to get the Elite treatment recolor is the Barrel Break. Following in the similar trend with the “N-Strike Elite Jolt” this is probably just a re-color of the blaster, with no performance gain. 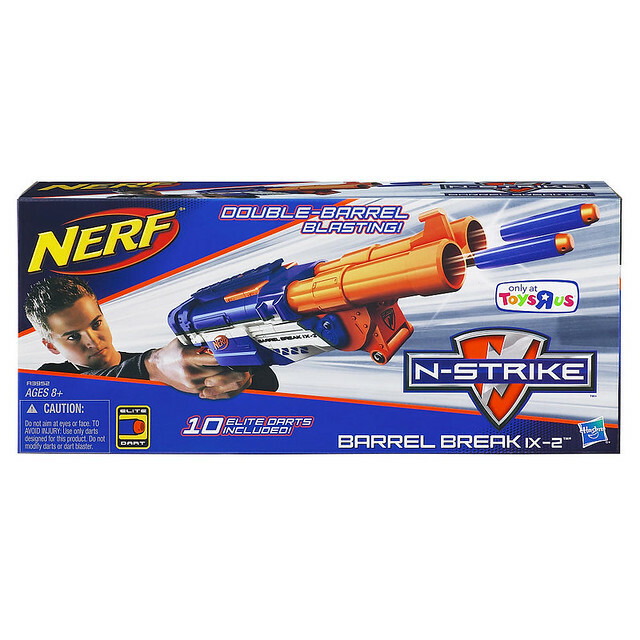 It still has the N-Strike name on the box, and the same N-Strike logo. The Toys R Us price is $24.99 though, and while it’s not out yet, the Toys R Us site puts the pre-order delivery date at 02/22/2013 (February 22, 2013). Product features are below. The Barrel Break IX-2 is a double-barrel blaster! Fire one Elite dart at a time or unleash both barrels at once! Elite Darts work with any N-Strike Elite blaster (sold separately). It’s a bit disappointing that they won’t be bringing back the Dart Holder that came with the original Barrel Break. I’d rather just get a Rough Cut to be honest. Click here to view the Toys R Us listing for the Barrel Break IX-2. 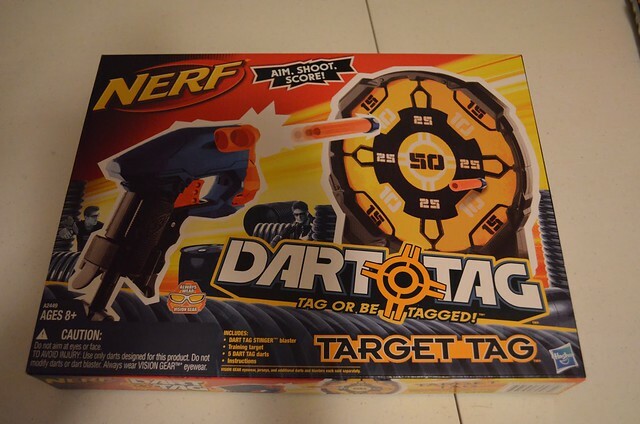 Check below for the Toys R Us listing and pre-order shipping date of the long awaited Dart Tag Snapfire 8. Nerf2me2 managed to find two new Nerf products in his Toys R Us in Arizona. 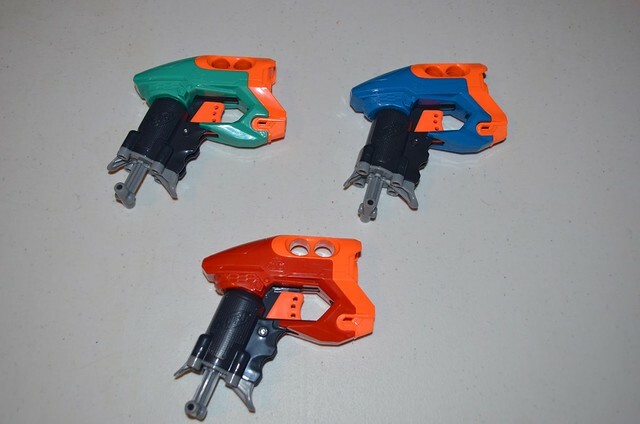 One is the Stinger, a Dart Tag blaster that was previewed in the Agros UK magazine. 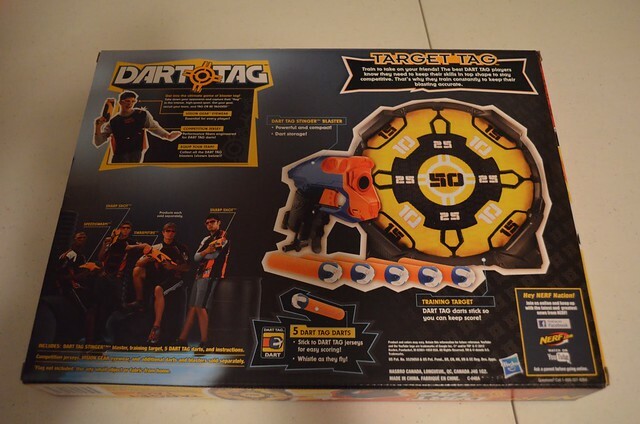 The whole product is going under the name “Dart Tag Target Tag”. It was being sold for $19.99. he Stinger is pretty much a more streamlined and more comfortable Jolt. It uses the exact same design with just a little more plastic shell so that you can hold the extra 2 darts up top. Straight out of the box it seems like its using a little higher powered spring but wont know for sure till I can do some testing. The Darts are now Y coded and seem to be made kinda of cheap. They are the same dart just a little different color tip and different codes. It could just be me but thats what they seem to me. As for the Target, not much to talk about. It has a Fold Out Stand on the back or you can hang it on a wall. Not all the Used Darts like to stick, but it works. 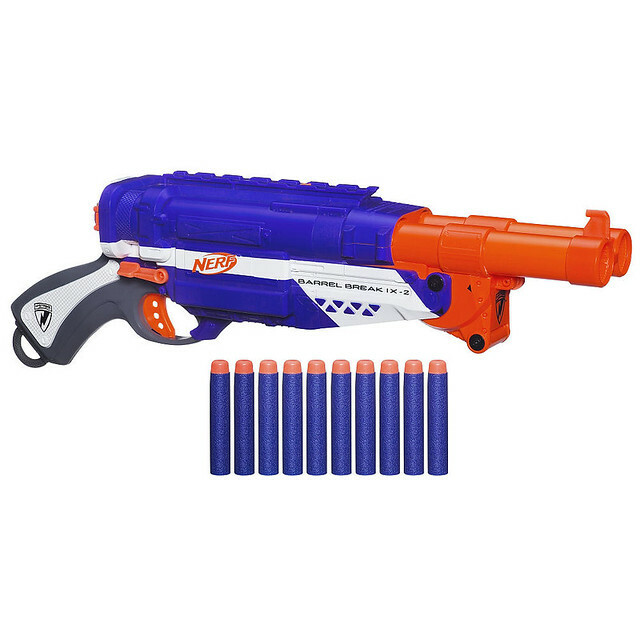 UK Nerf has more photos of this blaster, but essentially it’s a glorified Jolt. 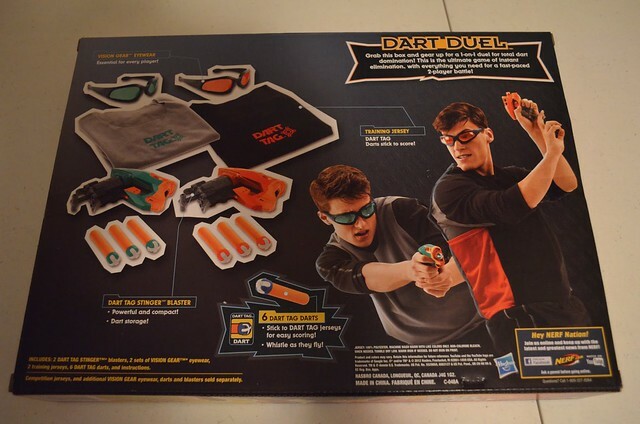 However he also discovered a new product not mentioned anywhere before, called the Dart Tag “Dart Duel”. It was being sold for $29.99. Stingers are the Exact Same as Above however they come in an awesome Red and Green Color! Darts are again Y coded and seamed even cheaper than the ones above. They are Red and Green tips which is kinda of cool but just dont seem to be up to par when it comes to how they are made. The Vision Gear (Glasses) Are the same as they all ways have however, they have green and red lenses. The Jerseys again, are nothing but a cheap material that the darts stick to. Nothing to exciting.